North Carolina spans a mountains-to-sea spectrum of scenic beauty. From the Great Smokies and the Blue Ridge Parkway to the Piedmont and the Outer Bands, North Carolina ranks amount the nation’s top outdoor recreation states. Hiking North Carolina is a comprehensive state-wide hiking guide, featuring more than 200 hikes in all regions of the state-including the Appalachian Trail, Grandfather Mountain, Linville Gorge and Shining Rock wilderness areas, and Roan Mountain, as well as the Charlotte, Durham, and Raleigh greenways, and the coastal areas of Nags Head, Cape Lookout, and Cape Hatteras. This guide includes mile-by-mile trail descriptions, evocative black-and-white photos, detailed maps, and a listing of trail-related Internet addresses to help you plan for and enjoy your next trip. Whether you are interested in a challenging backpacking adventure deep in the heart of the Appalachian Mountains or an easy day hike along a greenway or an ocean beach, Hiking North Carolina is an indispensable part of your next outing. 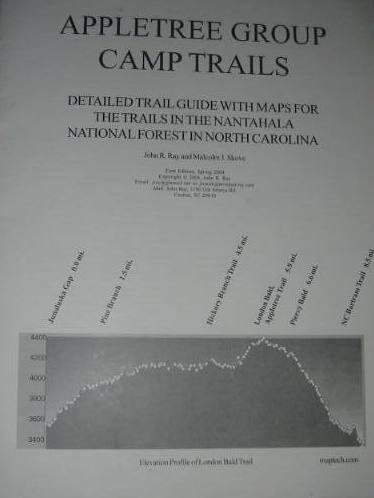 This is another of Tim Homan’s guidebooks that covers over twenty-five wilderness and wild-river trails in the Southern Nantahalas of western North Carolina. In also includes the Ellicott Wilderness and the Chattooga River in an area that joins the states of North Carolina, South Carolina, and Georgia. The guide is easy to follow and includes both road and trail maps. Birdshooter’s Take: Author Tim Homan has a number of guidebooks for hikes in the Southeast and I have found his writings to be among the best. There is detailed history on the Southern Nantahala, Ellicott Rock and Chattooga River in this book with thorough directions to the trailheads, nature notes, and a difficulty rating for both day hikers and backpackers. My Recommendation: This guide is currently the best and only book available if you plan to hike in the Ellicott Rock/Chattooga River area. This revised edition of one of Backcountry’s bestselling hiking guides features several new trails and new and improved maps. The Great Smokies and Blue Ridge mountains are the most visited natural areas in the United States. The mountain ranges of North Carolina–from the Blue Ridge and Great Smoky Mountains to the southern foothills–offer an abundant variety of terrain, scenery, and wildlife to those who explore them. Distinguished by steep gorges, spectacular waterfalls, lush forests of rhododendron and laurel, and the blue haze that hangs over distant views, North Carolina’s mountains are a popular hiking destination in every season of the year. The authors of this guide have explored more than 350 miles of trails through the mountains of their home state to choose 50 of their favorite day hikes, ranging from 1 to 15 miles. The hikes vary in difficulty and offer something for hikers of all abilities. Many trails are conveniently accessed from the scenic Blue Ridge Parkway, and several are handicapped-accessible. Each hike description includes directions to the trailhead, hiking distance, and estimated hiking time; detailed trail descriptions, safety precautions, and topographical maps; options for longer and shorter hikes on adjacent trails; and folk stories, historical anecdotes, and natural history information. 50 black and white photographs, 51 maps. Birdshooter’s Take: 50 Hikes In The Mountains Of North Carolina is similar in design and scope to the book Hiking North Carolina which is detailed above. The main difference is the amount of summarized details in the overview of each hike (where Hiking North Carolina has the edge) and in the trail maps. 50 Hikes In The Mountains Of North Carolina uses actual topographical maps and overlays the hiking trail on a black and white copy of the map. I find this feature particularly useful since I often use topographical maps on the trail. My Recommendation: If you do most of your hiking in the western part of North Carolina, you get more for your money with this book and the maps are a bit superior to those in Hiking North Carolina. Birdshooter’s Take: There are more than 900 hiking trails in this book by Allen de Hart which is far more than any other guidebook on North Carolina. If you can’t find a trail on the Internet or in any other trail book, chances are you will find it here. Although the sheer number of trails can be overwhelming and difficult to keep current, this is a great resource for trail data in the State. North Carolina Hiking Trails is currently on it’s third edition and it includes trails that are often overlooked including those on municipal, university, private, and commercial land. Don’t expect trail or profile maps in this book, but except a wealth of information. My Recommendation: This book is not for beginners. Get Hiking North Carolina (shown above) if you are just starting to hike in the State. 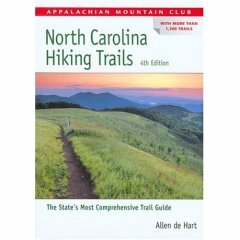 However, if you are a serious hiker or backpacker and spend a lot of time on trails in North Carolina you must have this book, especially if you are looking for those lesser known spectacular sites in the State. Maps are included with this book. One of the richest expanses of undeveloped land in the Southeast, the Great Smoky Mountains National Park attracts more than 9 million visitors a year. Even so, most people experience only a few of the most popular trails in the area. Day and Overnight Hikes in the Great Smoky Mountains National Park takes hikers off the beaten track to the more secluded rambles, from highland meadows and open vistas to pristine mountain streams and pioneer farms. Each trail description offers precise commentary on what to expect along the way and rates each hike for: scenery, trail condition, difficulty, accessibility for children, and solitude. Designed to fit easily into a back pocket, the revised and updated second edition of Day and Overnight Hikes includes 10 new hikes that lead to even more sites of exceptional beauty and solitude. The peace of mind found on these hikes just can’t be experienced from a climate-controlled automobile, so let Day and Overnight Hikes help you discover the best the Smokies have to offer. Birdshooter’s Take: There are quite a few books on hikes in the Great Smoky Mountains. My personal favorite is Hiking Trails of the Smokies by the Great Smoky Mountains Natural History Association. However since I can’t seem to find it listed anywhere with Amazon, the book above is a good alternative. My Recommendation: Get Hiking Trails of the Smokies if you can find it. It has a U.S. National Park Service Map that comes with the book and profiles of ascents and descents. There is also detailed trail information and history for each hike. But if you can’t find Hiking Trails of the Smokies, go with the book shown here. Chunky Gal/Fires Creek Rim Trail Guide. Covers the Chunky Gal Trail (22 mi.) starting near Deep Gap near Standing Indian Mtn. west of Franklin, NC to its termination point on the Fires Creek Rim Trail on Tusquitee Bald (5200 ft.). Also the Fires Creek Rim Trail (26 mi.) and open side trails down into the Fires Creek Basin. The road structure of the main roads in the Basin are also shown to allow for day-hike explorations. Also the Old Road Gap Trail which leads down from County Corners to Junaluska Gap is included. 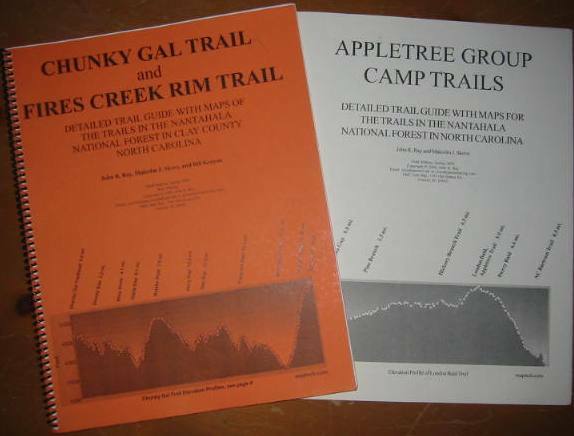 Maps for the Appletree Trails but no detailed discussion is given of the Appletree Trails that are used to connect Fires Creek to the NC Bartram Trail and the Appalachian Trail. This guide contains the maps and detailed discussion for the trail in the Appletree Camp Area (26 mi.). The guides have detailed trail descriptions along with GPS generated TOPO maps (made with Terrain Navigator Pro from maptech.com) of the trail with the mileage denoted along the trail. The mileage is obtained by rolling a wheel. Water sources, campsites, and other features discussed in the guide are tied to the mileage markers on the maps. The maps are on 8.5×11 sheets with between 5 to 10 mile sections shown on each map. There is a set of overlapping maps to cover the entire trail along with an overview map of the entire trail. Road access points are described to allow for day hike shuttle arrangements. Elevation profiles of the longer trails are included. 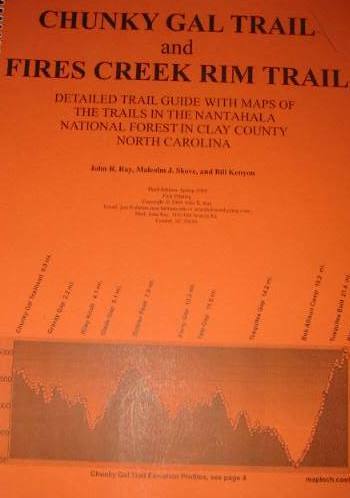 Birdshooter’s Take: These booklets by John Ray and Malcolm Skove (Chunky Gal Trail/Fires Creek Rim Trail and Appletree Group Camp Trails) are the most detailed trail guides available for these areas. They include trail mileage (in 0.1 mile increments), profile and topographical maps, and detailed directions to many trailheads along the route. My Recommendation: If you are going to hike these wilderness areas, don’t do them without these books. Visit your nearest outfitter in the Southeastern states or email the authors via this link to get a copy. They run around $5 for each booklet plus shipping and handling. A small discount is available if you purchase both books. Note: These guides are only available in select stores or via direct mail order from the author. Click the link above to launch your email browser and send an email to the author.